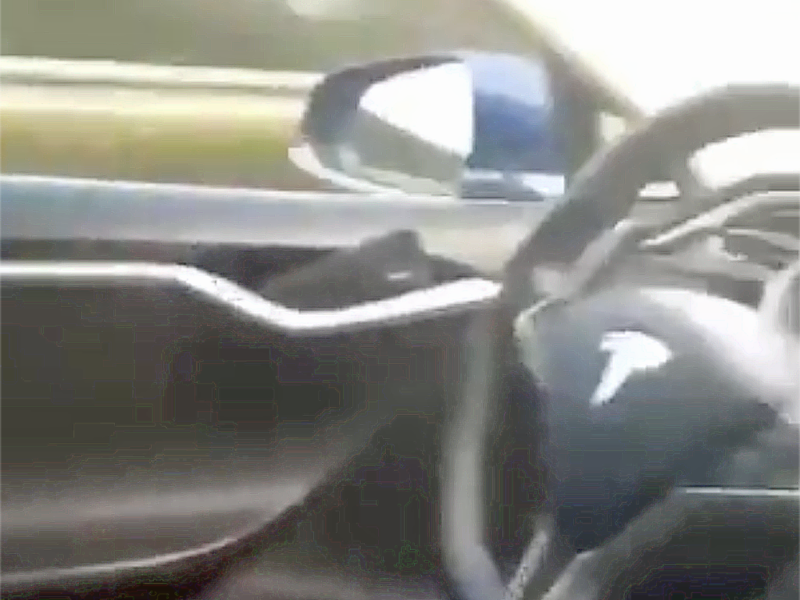 Video showing a Tesla Model S driving at speed on a road with no one in the driver's seat circulated on social media Tuesday night. The luxury electric car appeared to be operating on Autopilot, Tesla's semi-autonomous-driving technology that allows its vehicles equipped with the feature to steer, accelerate, brake, and change lanes with driver supervision. At one point, a camera pans around the cabin to reveal a person lying down in the back seat. Videos showing Tesla drivers asleep or otherwise preoccupied behind the steering wheel are fairly common, even as the carmaker implores its customers to remain in control of their vehicles while operating them on Autopilot. At one point in the video, the camera pans toward the windshield to show the car is traveling at speed down a two-lane road. The digital instrument cluster can be seen with "115" displayed, but it was not immediately clear whether that number represented miles-per-hour, or kilometers-per-hour.